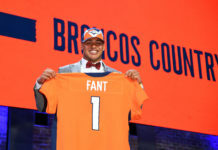 The Broncos welcomed a pair of NFL legends to OTAs Thursday, as members of the Super Bowl 50 championship team showed up to Dove Valley for an up-close view of the 2018 squad. 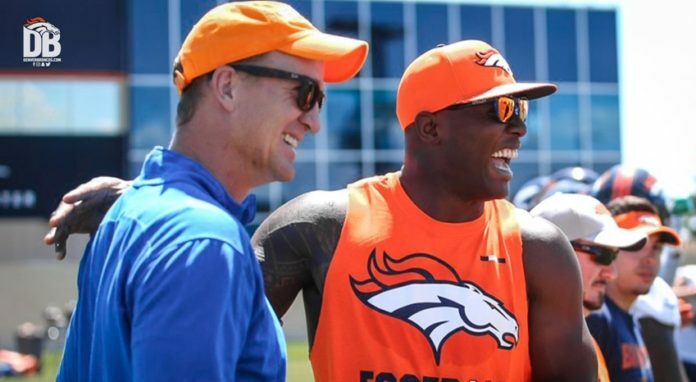 Both Peyton Manning and DeMarcus Ware were in attendance Thursday as the team concluded the second three-day OTA period this May. Ware has been working with the Broncos young pass rushers as a guest coast throughout OTAs. Manning appeared to simply be in attendance as a guest Thursday, but reportedly has been working with Colts QB Andrew Luck this spring. Ware, now 35, retired in 2016 as one of the league’s all-time great pass rushers. In 12 seasons with the Cowboys and Broncos, Ware recorded 138.5 sacks and over 500 total tackles. The versatile defensive end/linebacker was widely revered for his football savvy and for always being one step ahead of opposing linemen. With his playing days behind him, Ware is now taking the time to pass down some of that wisdom to a younger generation of players. Following Wednesday’s practice, defensive end Shelby Harris explained what it is like to work with someone like Ware. “When DeMarcus says something, you listen. 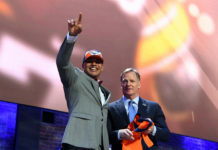 Because you know he’s one of the all-time greats when it comes to getting to the quarterback,” Harris said. The Broncos will conclude OTAs from June 4-7 and will hold a mandatory minicamp from June 12-14.